My Jesus Project – Jesus Turning the Tables: Is Love the Root of All Evil? I was invited to preach at Portland First Christian Church on Sunday, March 8th. The biblical text was from Mark 11:15-19 in which Jesus cleanses the temple by driving out the moneychangers during passover from Herod’s temple. Read the manuscript (somewhat different than the actual spoken version) below. To listen to an audio version of the message, CLICK HERE. This was my sort of Christian Anarchist take on the text, which is pretty “radical” to begin with. It’s not really the fire-breathing “burn it all down” kind of tone you might think; rather, I wanted to show people how much of Christian Anarchism resonated with, even when they don’t even know it’s that. When I was a teenager, I wanted to be a rock star. I don’t have a way to project a picture of how I looked back in those days, but I’m sure if you ask, Amy would be more than happy to show one to you. She gets a good laugh about me with my blond hair, all the way down to the small of my back, my silk shirts and my little round John Lennon sunglasses. Yeah, it may sound ridiculous now, but back then, I was kind of awesome. At least in my own mind, I was. From the fifth grade on, I played the drums, at least until I figured out that girls didn’t pay a lot of attention to the drummer. So my sophomore year in high school I switched to singing and playing guitar. I was in different bands through college, worked for a few record companies and had fun. But I was also kind of a mess. Rock star living is hard living, it turns out, even if you’re not actually famous. And being in bands is great, until you’re out of college and still working as a waiter at TGI Fridays so you can play gigs at night. In other words, I was going nowhere. But more important, I wasn’t as happy as I thought I’d be. I mean I had fun, enjoyed myself most of the time, but I wasn’t actually HAPPY. I kind of put my musician days on a shelf until I met Amy, and she convinced me – not exactly kicking and screaming, but close – to go visit her church in Denver. I said I’d go once if she promised never to ask me again. She agreed, so I went. And it wasn’t as awful as I had expected. People were nice. They were good to each other. They were real, not just what they were told “Christians” were supposed to be. Plus they went out for beer afterward and I thought Amy was pretty hot, so I went back. And then a few weeks later, they asked me to play music in worship. I told them I didn’t do any songs with “Jesus” or “Glory,” in them, but they said just to play something form my heart. That was easy. I mean, every song I wrote was from my heart. But that’s not really what people want on a night club stage. They want energy, sweat and blood…they want to have fun. So you give them what they want or you don’t get asked back. Well, I’m not one for born again moments. But the next thing I know I was singing at the pastor’s wedding in Boulder. A pastor friend of his came up afterward and said how much he loved the music. “What I wouldn’t give for a musician like you to lead worship in my church.” The idea was ridiculous, of course. But I just played the geography card. I told him thanks, but that Amy and I were moving to Fort Worth in a few weeks for her to go to graduate school. “No kidding,” he smiled. “My church is less than a mile from her new school.” So I became a stinkin’ music minister. Writing was no different. I was going to be the next J.D. Salinger. I had more of my own ideas, misdirected and selfish as they may have been. There were lots of obvious signs about how to use my talents otherwise. There was lots of me saying “no.” And yet, here I am, a Christian writer and musician, preaching to a sanctuary full of people in a 135-year-old church in Portland, Oregon. Life is really weird. But it can be pretty great if we’ll get out of the way. This scripture actually reminds me of that scene in The Jerk, when Steve Martin is hiding behind a stack of oil cans at the gas station and the bad guys are shooting at him. “It’s the cans!” he yells. “They hate the cans! Stay away from the cans!” We could look at this scripture and get the feeling Jesus really hates tables. Or moneychangers. Or money. One of the most mis-quoted statements in scripture is that “money is the root of all evil.” But money is amoral. It just sits there. It’s a glorified piece of paper. The only power and value it has is the power and value we give it. Which is especially remarkable since we’ve abandoned the gold standard, which mean our $16 trillion economy effectively is based on a shared fiction, an idea we just all agree to believe. But the prophet Timothy actually never says the money is evil. He says that the love of money is the root of all evil. I think that’s actually way more profound than we may notice on first glance. But before we consider the implications of that more deeply, let’s go back to the poor, misunderstood moneychangers in the temple. It’s interesting that, in the Synopitc Gospels – Mark, Matthew and Luke – this story takes place toward the beginning of the books, while John has it toward the end. Some people believe that there were two separate incidents in which Jesus freaked out in Herod’s temple during Passover and did this. More likely, at least to me, is that the authors of the Gospels had different agendas to convey with the story. At the beginning of a gospel it’s setting the tone for his ministry to come. It establishes him as a challenger of the current systems that exploit the poor. In this case, the moneychangers, preyed particularly on the poor and on women who had nothing to sacrifice in the temple by taking what little they had and giving them doves. He would have been calling out the equivalent of the predatory lenders of the day, which was a statement of political and social justice significance. He was literally turning the tables on the whole system of temple sacrifice, which most certainly would have been seen as a statement of religious significance. He was throwing a wrench in what would have been the biggest economic season of the year, equivalent to banning, say, stores making millions on millions of dollars off of what was intended to be a religious holiday. So this also was an action of economic significance. And in the Gospel of John, its suggested that his claims of authority in “my Father’s house” is further evidence in the case the author builds for the divinity of Jesus, which gives it profound theological significance. And some say this is the most violent act of Jesus’ entire ministry. So it might seem weird to suggest that it all comes down to Love. In the TV show Breaking Bad, a high school chemistry teacher, Walter White, is diagnosed with terminal cancer. With no savings and a son with disabilities, he is desperate to leave a nest egg to care for them. So of course, he does what any resourceful chemistry teacher would do; he cooks and deals meth. He devolves from a simple teacher and family man into a hardened drug kingpin, all under the pretense of providing for those whom he loves. And although he justifies his illegal pursuits because of this love, it’s the very thing that threatens to destroy him, his family, their home, and everything else he cares about. It seems that love can be terribly destructive. No one can argue that Walt doesn’t love his family, and if he didn’t have them to care for, it’s clear in the story that he would have forgone the expensive treatment and let nature take its course. But love appears to be the only culprit. Granted, Walt made a series of compromising choices along the way, and there are loads of justifications in his wake, but without the love for his family, none of this would have happened. If this is really love, then the human heart should be categorized as a concealed weapon. The mind may hatch the schemes and formulate the justifications, the hands may build the bombs and wield the swords, but the heart, driven supposedly by love, is the match to the fuse that sets the whole damned thing in motion. Timothy warned us that the love of money was the root of all evil. Jesus, too, knew that money was a big stumbling block for us even in his day, given that he refers to money more times than anything else in the Gospels. Can love, when misdirected or misapplied, be the root of all evil? If we invest our love in anything other than God first, it mutates into idolatry, making room for no other. It is a selfish, consuming, jealous kind of love, and yet one that never satisfies. We don’t like hearing this. I don’t like hearing this. We prefer to focus on love as white doves, big hugs, smiling children, and olive branches. Or we talk about Jesus’ sacrificial love for us. But that’s still not a complete picture. Consider the image that Timothy paints, and that Jesus reacts against in this passage. It’s misdirected love that it is the taproot, the means by which evil gains its nourishment. 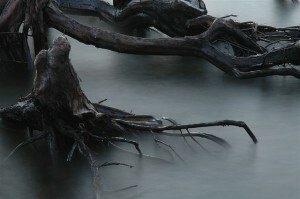 A root system, after all, doesn’t discriminate between pure water and a poisoned source when it is passing through. Love is, by definition, a wide-open gate, though which all may pass, sometimes for better or worse. We have some choices, then, when tapping into this root source of love. We can enjoy the immediate benefits of misplaced love, while ignoring the risks involved. We can tell ourselves that such corrupt love makes the collateral damage all worth it. Or we can cut the root off at the base, severing ourselves from love, in order to mitigate the risk of the dangers that accompany it. But, as is often the case with Jesus, theres a third way. We can choose to draw the nourishment and the rootedness for our love from the purest source, the one that never runs dry, never deceives, never ends, as Paul says. But like everything else, it’s a choice. And not just a choice we make once and we’re done with it. We have to choose God as the first and foremost source and center, over and over again, day after day. I struggle with this all the time. My music only had the meaning, effect and fulfillment I really longed for once I gave up control and handed it over. Same with my writing. Time and again, I see evidence of this being the way, the truth, the path to real life. And so often I decide I don’t trust it as much as I thought I did, and I take it all back. We have to gather our love, our hope, our ambitions, our desire, our lives, and hand them over. It’s a big thing. It’s a lot to ask to let it go. But to paraphrase the sixties author Jess Lair, the most loving thing to do is to let go. When you are constantly bombarded with the world’s definition of love, it’s refreshing to get a new perspective. “If we invest our love in anything other than God first, it mutates into idolatry, making room for no other. It is a selfish, consuming, jealous kind of love, and yet one that never satisfies.” This is my favorite line by far, I have seen both sides of this and know you speak truth. Thank you for following and allowing us to grow through it.